Inventory We are a resale marketplace, not a box office or venue. Ticket prices may exceed face value. This site is not owned by BB&T Center . 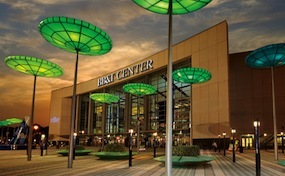 The BB&T Center has been through many name changes such as the Broward County Civic Arena, National Car Rental Center and Office Depot Center. The two constants have been the home to the Florida Panthers of the National Hockey League and consistently bringing in fantastic concerts. The Bank Atlantic Center gives fans north of Miami in Ft Lauderdale a great venue to visit to get some high qualtiy entertainment. With the nations biggest acts making this a perinial tour stop the BB&T Center is one of the top venues in South Florida. South Florida has a economically and culturally diverse crowd which helps sell out many events at all levles of seating. In 1996 more than one dozen architects, engineers, and contractors were brought together to brainstorm the BB&T Center schematics. A mere two years later the project was finished; a state of the art facility that took fewer than thirty-one months to erect from start to finish. Nearly 1,100 workers were on site at any given time to finish this rush order masterpiece. CenterSunrise.com is not affiliated with any primary box office or supplier. We are a privately owned and operated business specializing in sales in the secondary market. To buy tickets for any Bank Atlantic Center events in Miami simply click on the event of interest or call our operators at anytime.